Banish holiday tension with treatments meant to be enjoyed together. 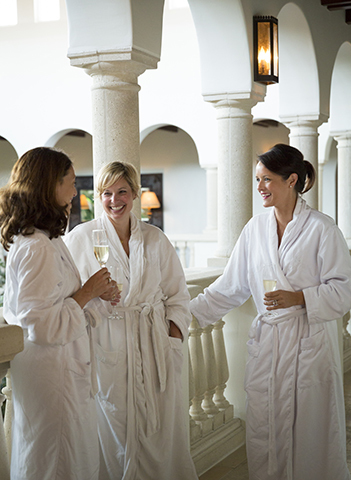 Elevate your experience at The Spa and Salon at Sea Island by relaxing with people you love. When holiday season rolls in on its annual tide, life can get complicated: hosting dinners, attending parties, shopping, baking, family visits—simply translated, it can mean skyrocketing stress levels. Escaping, even for a little while, to a serene spa setting can be the perfect way to reset your focus and restore equilibrium. Sharing the experience with someone close to you can make it even more enjoyable. Within the sanctuary of Sea Island’s spa environment, the generously proportioned couples treatment suite features a cozy fireplace, tub for two and two massage tables, enveloping guests in an intimate setting that invites relaxation. The room opens onto a balcony, and a private bathroom suite means not having to leave the space to shower after a scrub or wrap. Just in time for the holiday season, the spa menu has been redesigned so most treatments can be customized for two guests in the spa suite. Stimpson explains that whether you are with your mother, best gal pal or significant other, you can maximize the experience by embracing togetherness. “Couples’ treatments deliver the most benefit if you’re with someone you truly enjoy spending time with,” she adds. The sense of well-being that results from a skillfully administered treatment with someone special can last long after the treatment itself. You’ll be ready for holiday traffic and shopping crowds in no time. Before you melt into relaxation, bond with your partner in crime over a bottle of Sea Island wine and an assortment of chocolates. This treatment includes one 60-minute facial or massage per person, and 90 minutes of private spa suite time to enjoy the soaking tub, fireplace and balcony. This treatment lasts three hours beginning with an hourlong yoga session for two, followed by a shower and a stay in the private spa suite with a 60-minute massage. Couples also enjoy a 20-minute essential oil bath, a bottle of Sea Island wine, an assortment of chocolates and a special spa gift. Alternatively, twosomes can opt to skip the yoga session and spend extra time in the private spa suite with glasses of mulled wine, sitting by the fire.